All horses (in the northern hemisphere) experience a seasonal rise in ACTH levels from around July/August to October/November, usually peaking in September/October. Horses with PPID (Cushing's) have significantly higher ACTH levels than healthy horses, and their seasonal rise may last longer, particulary in older horses/as PPID advances. See graph showing ACTH concentrations in normal and PPID horses throughout 2009 - Liphook Equine Hospital. Horses that are developing PPID often first present with unexplained autumn laminitis long before coat changes are seen, and any horse having unexplained laminitis for the first time in the autumn should be tested for PPID by testing ACTH (and preferably insulin and glucose too). Liphook Equine Hospital (UK) has adjusted its normal ranges for ACTH to take account of the seasonal rise. Many horses diagnosed with PPID need a higher dose of Pergolide during the seasonal rise, which can often be tapered down again from around December (with symptoms closely monitored), and increasing doses may be needed as the horse gets older. Some vets will suggest a trial of Pergolide for any horse with unexplained and unresolved autumn laminitis. See the ECIR website for more information. "Results: Upper limits for reference interval of plasma ACTH were 29 pg/ml between November and July and 47 pg/ml between August and October. Circannual variation in plasma ACTH occurred in both non-PPID and PPID horses with the highest ACTH concentrations found between August and October in both groups. The greatest difference between the 2 populations also occurred between August and October. Conclusions: Plasma ACTH can be used for the diagnosis and monitoring of PPID throughout the year with the use of appropriate reference intervals. These findings demonstrate an increase in pituitary gland secretory activity during the late summer and autumn in both normal and PPID cases." "RESULTS: The fall peak plasma α-MSH concentration occurred earlier in horses residing at more northern locations. Mean seasonal α-MSH concentrations were similar in all healthy groups at all locations, but in the fall, plasma ACTH concentrations were higher in horses living in more southern locations. Plasma ACTH but not α-MSH concentrations were higher in Morgan horses compared with light breed horses from the same location. Hormone concentrations of ponies did not differ from those of horses during either season. Concentrations of both hormones were high in the fall compared with the spring in horses with PPID. CONCLUSIONS AND CLINICAL IMPORTANCE: These findings suggest geographic location of residence and breed may affect the onset, amplitude, or both of the seasonal peak of pars intermedia (PI) hormones and should be considered when performing diagnostic testing for PPID. Horses with PPID maintain seasonal regulation of PI hormone output." "Endogenous and TRH-stimulated ACTH and α-MSH concentrations were significantly different across months with higher concentrations in the summer and fall compared with February." "Horses with PPID have significantly higher mean ACTH concentrations that controls across all sampling time-points and seasons, with concentrations in both affected and control animals greatest in September and December." October (3 of 9) with ACTH concentrations above the cutoff for Cushing’s disease (70 pg/mL), whereas no more than 2 of 7 control horses had such high ACTH concentrations in August and in October." "Log ACTH concentration was increased during photoperiod 4 (6-7 Aug) through 8 (16-18 Oct), compared with photoperiod 1 (13 Feb-2 Mar) through 3 (19-22 Jun), in all groups. In photoperiod 3 (19-22 Jun) through 7 (26-28 Sep), log ACTH concentrations were higher in horses and ponies with PPID, compared with values for control horses and ponies. "In summary, plasma ACTH concentration was markedly higher in September than in January and May. Clinically important seasonal differences in DST results were present. The positive correlations between age and plasma ACTH concentration and plasma cortisol concentration suggests deterioration in PA function with age." Alpha-MSH was higher in September compared with January, March, April, June and November. Increased alpha-MSH has been found in Soay sheep in Scotland in late summer/autumn, at the same time as peaks in body weight, voluntary food intake and condition, suggesting that alpha-MSH or other POMC hormones may play a role in metabolic preparation for winter. 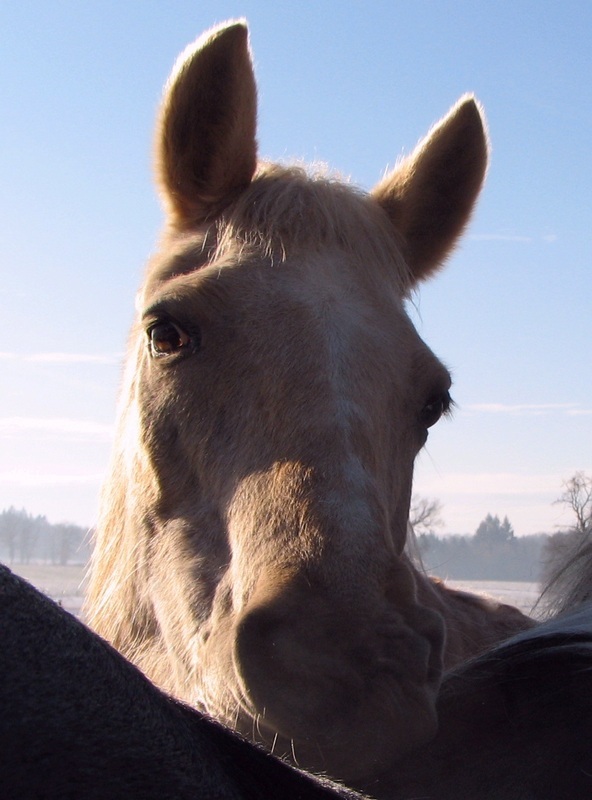 The paper suggests that it is possible that horses have a similar seasonal increase in POMC hormones to prepare them for less readily available food during the winter. Three forms of laminitis are currently recognized. Endocrinopathic laminitis - related to insulin dysregulation (due to Equine Metabolic Syndrome, PPID and corticosteroid use), likely to make up around 90% of all laminitis cases. Sepsis Associated Laminitis (SAL) - "sick horse laminitis" - the horse is already very ill and develops laminitis as a result of the initial illness (e.g. colitis, septicaemia, retained placenta). Supporting Limb Laminitis (SLL) - "lame horse laminitis" - the horse is already very lame and develops laminitis in a weight-bearing limb as a result of the initial lameness (e.g. fracture, septic joint). Sepsis Associated (or Related) Laminitis was previously referred to as Systemic Inflammatory Response Syndrome (SIRS) - SIRS is a condition describing sepsis seen in humans and other species but not specifically relating to laminitis. When a horse has sepsis associated laminitis, the horse will be systemically ill with a raised temperature, likely changes in WBCs, often diarrhoea & depression. Causes include carbohydrate overload, colitis, peritonitis, pleuropneumonia, enteritis, endometritis, endotoxemia. retained placenta, black walnut shavings. Laminitis is secondary to the primary illness - the primary illness must be treated. SIRS can cause organ and tissue damage as well as acute laminitis. Icing the feet can be very effective for SAL. Horses given 10 g/kg BW oligofructose had whole blood increases in interleukin-1beta, interleukin-8 and interleukin-10 8 hours after administration, clinical signs of laminitis were seen between 12 and 24 hours, therefore the research concluded that leukocyte cytokine expression increases as systemic inflammation develops and this is seen before lameness. Measures should be taken to control the systemic inflammatory response in order to lower the risk of laminitis developing in horses with SIRS. Tumor necrosis factor-alpha did not change. Increases in interleukin-6 were also seen but not until 16 and 20 hours after administration of OF. Lipopolysaccharide and oligofructose administration increased temperature, heart rate and respiratory rate. "A significant proinflammatory response is known to occur in the forelimb lamina after carbohydrate administration." Horses were given 17.6 g of starch/kg bodyweight (8.8 kg/500 kg horse) via nasogastric tube and anaesthetised either after developing a temperature > 38.9'C or at the onset of Obel grade 1 lameness. "Results: Increases in laminar MAC387-positive leucocytes and laminar messenger ribonucleic acid (mRNA) concentrations (P<0.05) for interleukin-1β, interleukin-6, cyclo-oxygenase-2, chemokine (C-X-C motif)ligand (CXCL)1 and CXCL8 were present in both fore- and hindlimb laminae from horses with OG1 lameness. Both CXCL1 and CXCL8 were also increased in forelimb and hindlimb laminae in the DEV horses. Conclusions: Administration of carbohydrate resulted in a similar inflammatory response in the hindlimb laminae to that previously reported for the forelimb laminae. These findings suggest that other factors, such as weightbearing, may play an important role in the development of laminitis after a systemic inflammatory condition develops. Potential relevance: Evidence of inflammation in the hindlimb laminae suggests that the hindfeet should be addressed in the septic horse at risk for laminitis; however, laminitis is often less severe in the hindlimbs due to other factors, such as weightbearing and hoof angle." Equine Vet J. 2011 Jan;43(1):54-61. doi: 10.1111/j.2042-3306.2010.00122.x. Laminar inflammatory gene expression in the carbohydrate overload model of equine laminitis. ​Is pasture associated laminitis SAL or endocrine? "Endocrinopathic laminitis primarily comprises equine metabolic syndrome (EMS, including pasture-associated laminitis) and pituitary pars intermedia dysfunction (PPID)..." - Equine Laminitis James Belknap 2017 Ch. 47 Belknap and Durham. Can eating grass cause SAL laminitis? Even with very high fructan levels in grass, it would be almost impossible for a horse to naturally ingest the amount of fructan used to experimentally induce laminitis over a whole day - and even if it could, the effect of the fructan would almost certainly be very different. It is almost certainly the sudden change caused by administering a large amount of fructan that caused the experimental laminitis, not the fructan itself. The fructan used to induce experimental laminitis is a short-chain fructan, different to the fructan found in grass. It is likely that a short-chain fructan would ferment more rapidly than the long-chain fructans found in grass, thereby causing a more significant effect. Horses that develop laminitis that seems to be related to eating grass do not show the raised temperature, abnormal white blood cell counts and diarrhoea seen in horses with SAL. If horses developed SAL from eating grass, then all horses (of different breeds, ages and fitness) in the same field would be likely to develop laminitis at the same time - this doesn't happen. 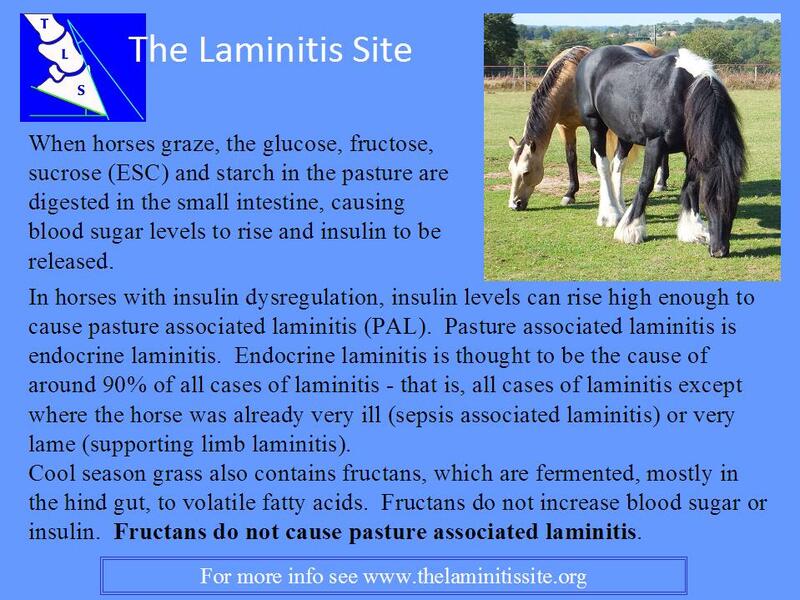 See Do fructans cause laminitis? for a detailed explanation. Faecal pH was not affected by length of grazing (3, 6, 9 or 24 hours had mean faecal pH of 7.23, 7.30, 7.32 and 7.61 respectively). 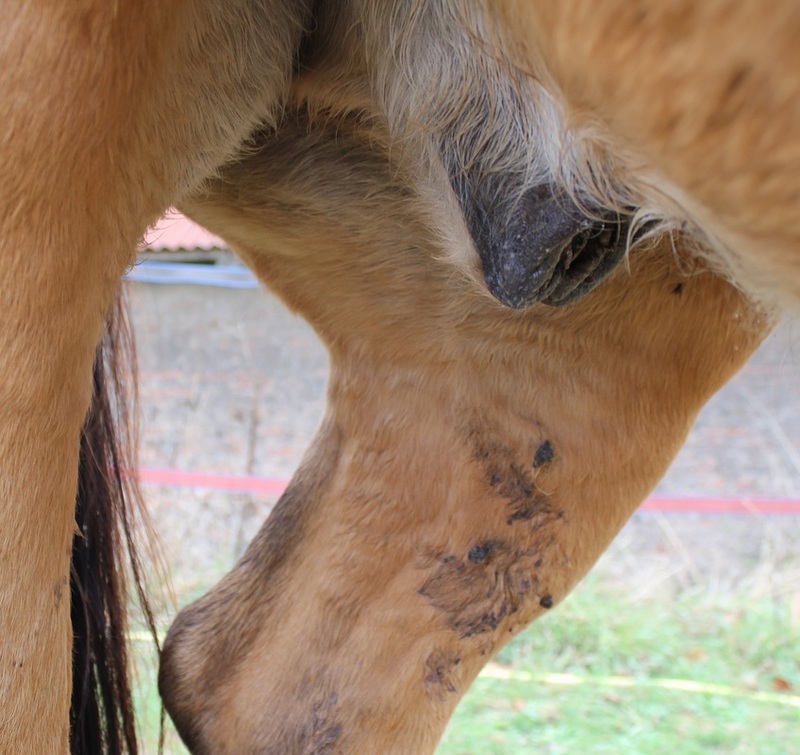 ​Swelling of the sheath and/or increased smegma (a wax-like substance produced by the inside of the sheath) have been reported by many owners as indicators of insulin dysregulation (ID) in their geldings, with an increase in swelling often preceding an episode of laminitis. The smegma tends to be black/grey, thick, greasy and strong smelling, and may be seen on the inner hind leg after the horse has been lying down. Owners often think that excessive smegma is normal for their horse, then notice an improvement when the horse is treated for PPID/ID. Both the swelling and smegma usually disappear as the diet is tightened, the horse loses weight and/or the ID is controlled. Many owners of ID horses check their gelding's sheath as well as neck crest and supraorbital sockets daily for signs of swelling, and take immediate action to tighten diet if any swelling or excess smegma is noticed. Owners have reported seeing very rapid (24 hours or less) changes in sheath size. 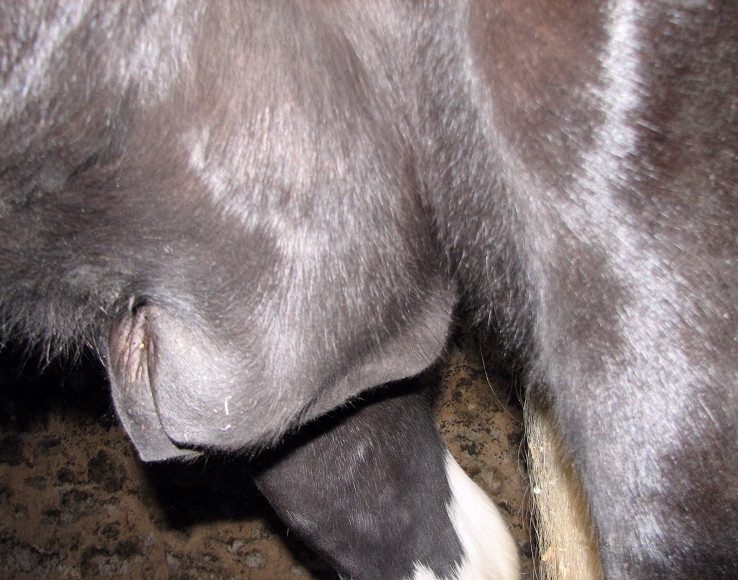 A swollen sheath is often thought to be due to an infection, and this should of course be ruled out, but when a swollen sheath appears with signs of laminitis, insulin dysregulation should always be considered. Keeping the sheath clean should lessen the chance of infection. It has been suggested that the sheath swelling is related to adipose (fat) tissue accumulation, which interferes with lymphatic flow. The swelling may develop when a horse is on box rest, and resolve with exercise. See Guide to Insulin Resistance and Laminitis for Equine Practitioners page 24/25. "The sheath also often becomes very fatty in overweight and insulin resistant horses. Sometimes distinguishing between a fat sheath and a swollen sheath can be difficult." Sheaths may need to be cleaned every 2 to 4 weeks with warm water, or KY jelly applied inside the sheath to loosen smegma. Avoid overcleaning, which may cause fungal overgrowth, but avoid excessive build up of smegma, which can cause discomfort, swelling or infection. According to XLEquine " Smegma build up is more common in the winter, especially if a horse is overweight as fat is partly stored in the sheath. Older geldings frequently have mildly swollen sheaths in the winter as they move around less and circulation in the sheath becomes poorer in the cold weather." Sinusitis is one of the more common infections seen in horses with PPID - abscesses, skin and lung infections are also reported. According to Dianne McFarlane*, opportunistic infections - that's an infection that wouldn't normally cause disease in a healthy horse, but does in a horse with an impaired immune system - were seen in around 35% of horses with PPID in one study. Several of the hormones produced in excess in PPID horses -ACTH, alpha-MSH and beta-endorphin - suppress the immune system. White blood cell function may be impaired in horses with PPID, and horses with PPID were found to have "increased expression of IL-8, which may influence the ability of horses with PPID to respond to bacterial pathogens" - McFarlane & Holbrook**. Primary sinusitis is usually reported as being unilateral (in one sinus/nostril only) and odourless, but in the cases TLS has seen of sinusitis in horses with PPID, the yellow/creamy coloured discharge has been distinctly unpleasant smelling, and has been bilateral (from both sinuses/nostrils). Usual causes of sinusitis are primary bacterial or fungal/mycotic infection, or secondary due to dental disease (also facial trauma, cysts and neoplasia). Treatment for sinusitis should involve ensuring that the PPID is well under control, by monitoring ACTH and other clinical symptoms, establishing the cause and treating appropriately. Somatostatin binds to receptors on pancreatic Islet cells to inhibit the secretion of insulin, glucago and pancreatic polypeptide. For 3 months 500 g of pelleted spirulina (composition not given) was fed to 6 obese EMS horses, plus 1.5% bodyweight Timothy hay; 6 healthy horses and 6 obese EMS horses were fed 500 g of hay pellets, plus 1.5% bodyweight Timothy hay. How much is stress involved in laminitis? How much does stress affect blood test results? "Transporting horses via horse trailer increases heart rate and serum cortisol levels." The use of a twitch significantly increased ACTH and cortisol, suggesting an increased stress response. Monosaccharides can be absorbed from the intestine without digestive enzyme activity. Glucose is the major sugar found in blood and can be used by all body tissue as an energy source, converted to glycogen for storage, converted to amino acids or converted to fat. Sugars are water soluble and ethanol soluble - they are included in both ESC and WSC (and NSC which is WSC plus starch). Some analyses include fructans in "sugars" - it is important to differentiate between simple sugars (glucose, fructose & sucrose - ESC) and fructans (approximately WSC - ESC), as the horse digests these in different ways (sugars and starch are hydrolyzed in the small intestine, fructans are fermented in the large intestine). For this reason, the use of the plant nomenclature WSC and NSC are unsuitable for horses, and The Laminitis Site suggests that carbohydrates should be divided into hydrolyzable carbohydrates and fermentable carbohydrates. Sucrose is the main sugar in the sap of plants. C3 grasses convert sucrose into fructans for storage in leaves and stems, and into starch for storage in seeds. Starch overload can lead to acidosis and sepsis associated laminitis. How much starch is likely to cause starch overload? Hydrolyzable carbohydrates (CHO-H) may be fermented in the hind gut if starch intake exceeds 0.4% of bodyweight per feeding (so 2 kg per meal per 500 kg horse ) - Potter et al. Digestion of starch in the small or large intestine of the equine 1992. 3. then 40% hay 60% grain with a starch content of 6.0 g/kg bw/d (WSC 1.5%, starch 32.9%, NDF 32.5%, CP 11.3%). All diets were divided into 3 equal meals/day. Throughout and after the research period, the horses remained healthy. Horses routinely fed diets with a high starch content had an increased capacity for glucose absorption compared to horses on a grass diet, due to an increase in SGLT-1 transporters in the small intestine. "In response to increased dietary carbohydrate, there is a coordinated enhancement in the rate of glucose transport across the luminal and basolateral membrane of equine enterocytes resulting in enhanced transcellular transport of glucose from the lumen of the intestine into the blood." Sugar and starch move from food ingested into the horse through the gut wall to the blood via transporters (SGLT-1, GLUT5, GLUT2). See Transporters for more details. Supporting limb laminitis generally develops in the foot opposite a leg which is extremely painful and cannot bear weight, often due to a fracture or joint or tendon sheath infection, or any condition that results in a long-term severe lameness in one leg. Hannah Galantino-Homer at the University of Pennsylvania will investigate the alterations that occur in the protein structure that supports the bone to the hoof connection. The goal is to understand the process of cell pathology in the foot to better predict, diagnose and treat support limb laminitis. Samantha Brooks at the University of Florida seeks to understand the response of the cells in the support structures within the hoof. By utilizing RNA sequencing, genes that respond to the abnormal support in the foot will be identified and compared to normal feet. Understanding the gene upregulation will help identify the process within the hoof that leads to support failure. The research will use real-time PCR to identify the production of inflammatory mediators and enzymes involved with the pathology. "Our long-term aim is to develop a gene therapy approach for the prevention of laminitis in the contralateral foot of horses with major musculoskeletal injuries and non-weight-bearing lameness." "Conclusions: The current experiments demonstrate that transgenes can be successfully delivered to the equine distal extremity using rAAV vectors and that serotypes 2/8, 2/9 and 2/1 can successfully transduce tissues of the equine foot. When the vector was diluted with surfactant-containing saline, the level of transduction increased dramatically. The increased level of transduction due to the addition of surfactant also improved the distribution pattern of transduction." Over 65,000 patient records at Rossdales Equine Practice were reviewed for cases of supporting limb laminitis (SLL) from Jan 2005 to Oct 2013. 11 cases were found - 9 horses, 1 pony, 1 donkey - 0.02% practice prevalence. 73% were Thoroughbreds, 9 were mares and 2 stallions. SLL was not restricted to horses that were non-weightbearing lame, it developed within 4-100 days after injury (median 14.5 days) and occurred most commonly in a forelimb (54.6 per cent, CI 25.1 to 84.0 per cent). Incidence of support limb laminitis in horses treated with half limb, full limb or transfixation pin casts: a retrospective study of 113 horses (2000-2009). "CONCLUSIONS: Support limb laminitis is a relatively common complication among horses treated with half limb, full limb and transfixation pin casts. Greater durations of casting and higher bodyweights increase the likelihood of developing this complication. POTENTIAL RELEVANCE: Support limb laminitis may occur secondary to any painful unilateral lameness and is not necessarily more likely to develop in horses with severe orthopaedic conditions such as fractures. However, heavier horses, those requiring casts for longer periods of time and those that require a full limb or transfixation pin cast as opposed to a half limb cast should be considered to have an increased risk for developing support limb laminitis post operatively." 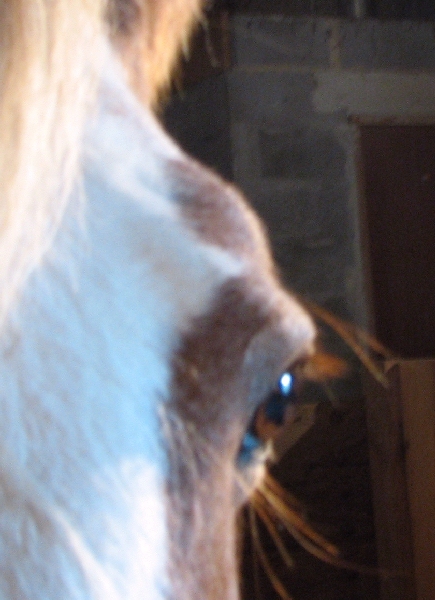 Horses with EMS and/or PPID often have fat in the supraorbital hollows above their eyes.